Located in the southeastern Pacific Ocean, Easter Island was given its name by Dutch explorer Jacob Roggeveen (who landed there on Easter Sunday in 1722), butis referred to as “Rapa Nui” by its 5,800 residents. It is also the famous home of 887 monumental statues called moai. 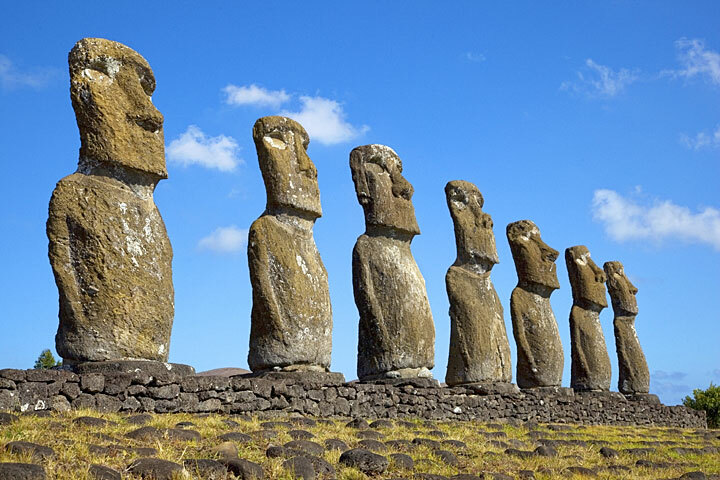 These statues were created between 1100 and 1680 A.D. by the island's native inhabitants, the Rapa Nui people, who most likely arrived from the Gambier or Marquesas Islands on canoes or catamarans. The moai were carved with stone chisels out of volcanic ash and probably erected with the help of 150-250 men and a Y-shaped sledge. This would have been quite a feat considering that the largest erect moai stands at 32.15 feet and weighs 82 tons! The original Rapa Nui constructed the statues as a representation of their ancestors who they believed provided everything they needed to live. Most of the moai are located along the coastline with their backs to the sea. The early Rapa Nui people had a strong class system and fierce wars broke out between the clans, leading to the eventual toppling of many of the moai. In addition to class wars and overpopulation leading to deforestation, the island and its people experienced many other hardships. Peruvian slave traders abducted over half of the population in the 1860s, and brought smallpox to the island as well. Many other residents including the island's first Christian missionary, Eugene Eyraud, were wiped out by tuberculosis. By the 1870s, over 97% of the population was gone, and only 111 inhabitants remained. Subsequently, Alexander Salmon, Jr. from Tahiti purchased the entire island except the Christian mission and helped develop tourism before eventually selling it to the Chilean government in 1888. Most of the island was then used as a sheep farm and the surviving residents were confined to the main town of Hanga Roa until the 1960s, only gaining Chilean citizenship in 1966. In addition to viewing the ancient moai, visitors can also go hiking, horseback riding, snorkeling, surfing, or spelunking, and the island can be reached via air from Santiago or Tahiti. Located 2,182 miles away from Chile, Easter Island is one of the most remote inhabited islands in the world, and it is sure to provide an experience like no other.